Flow visualization in the water supply tank: water supply and drain pipes are in the center of the tank. A new water supply tank with a diverging nozzle installed in the inlet pipe and a circular baffle plate installed in front of the outlet pipe, which is supposed to supply drinking water in the event of a natural disaster, is developed. 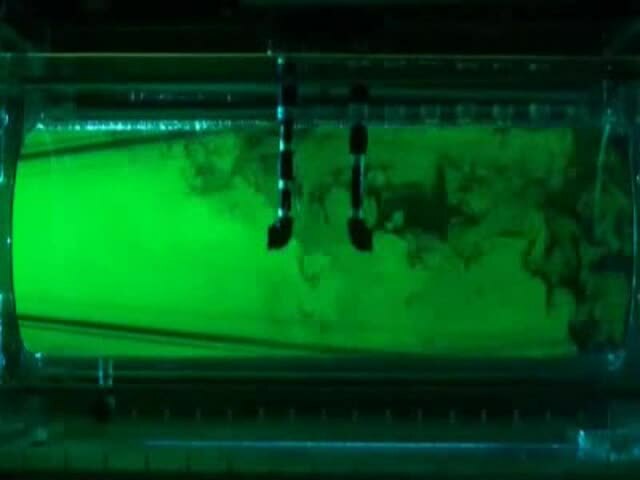 The effects of the structure and positions of inlet/outlet pipes and the temperature of the inlet water on the displacement efficiency of the tank are shown by means of flow visualization using a planar laser-induced-fluorescence (LIF) technique. Read more in Flow visualization and displacement efficiency of old water in a cylindrical water supply tank.